New York Fashion Week is quite possibly one of the most crucial events in any diary that belongs to a fashion insider. This event, attended by some of the most powerful people in fashion (yes Anna Wintour, we are looking at you) brings together the best designers stateside and showcases their work over a week long spectacle. Although seen as being more commercially driven than London fashion week, this season New York really upped the ante in terms of showcasing the creative side of designers. One of our favourite shows was the Rebecca Minkoff show which mixed the fiery, passionate reds of Mexican kitsch with laid back baggy cut, varsity style jackets and t-shirts. Playful slogans such as 'Let's all go to Mexico' were written across white t-shirts tucked into acid bright yellow lace pencil skirts. Hair and make up also followed a strong Hispanic vibe with thick dark eye brows being made a feature and hair braided to resemble Frida Kahlo's iconic hairstyle. The theme of Latin America was also carried through in the collections from Mara Hoffman and Tia Cibani who both delivered collections inspired by the warmth and colour of the region. Mara Hoffman's show channeled a 'Rainbow Warrior' feel with long, floaty dresses cinched in at the waist with a multi-coloured serpent belt and a third eye pattern that was repeated throughout on numerous garments. The hairstyles from the show were a major talking point. 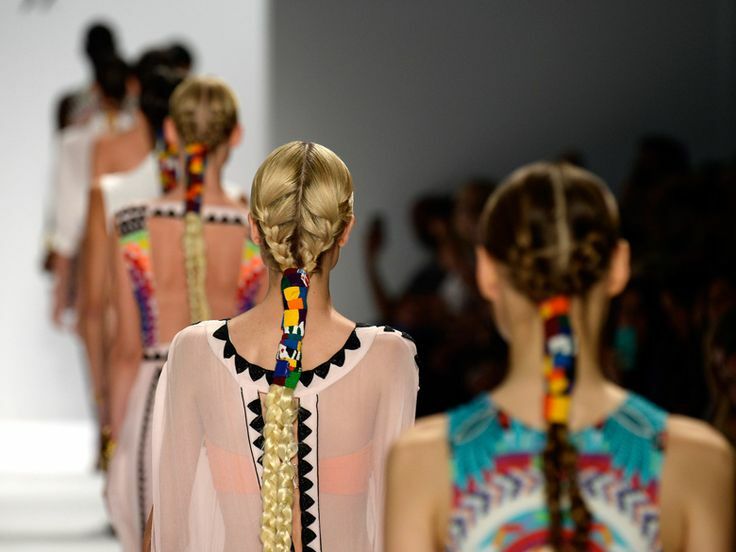 Models wore hair scraped back at the nape of the neck and braided in calf scraping braids that were joined together by pieces of woven cloth. Although the Mara Hoffman aesthetic may be niche, one thing is for certain this collection is guaranteed to lift spirits. Tia Cibani's collection takes on the true colours and textures of spring, mixing mint, pink and azure blue with poplin and jacquard. In a recent interview with Style.com, Tia Cibani explains that "I was thinking of the 1940s. And then I went to Mexico for a wedding, and everything changed." Long black dresses are worn with bright hair accessories and cropped jackets paired with baggy shorts form some of the staple looks from the collection. If Frida Kahlo was alive today, we are pretty sure Tia Cibani would be her personal dressmaker. It is a collection worthy of a modern Aztec queen.